I thought that it was only a few weeks since my last entry – but it’s been ages ! A fair bit has happened, so I’ll pinch Judy’s diary and get it all down. To get the basics out of the way the weather has been pretty good – mostly sunny and warm, although enough rain to keep everything green. The temperature hit 39 at one point, perhaps a little too warm. We haven’t been out an awful lot – with quite a few visitors over the next few months we are saving ourselves! My business has been intermittent as usual. One big job involved me actually staying away overnight in the Tarn et Garonne near Montauban. I had to draw up floorplans for a very large restored and updated house (5 garages, two guest cottages, cinema room €2.1m) and a small and rather disappointing chateau (only visited by its owner for 3 days last year). Details by return if interested. I also did a few elevated photography jobs for a local agent, and hope to get more work from them. We had an interesting visit from the local water board a few weeks ago. We think that the chap wanted to fit a new water meter, which is situated in one of our spare bedrooms. We were not too happy with his signs which seemed to indicate that they might have to dig up the floor inside! Anyway he apologised for not speaking English, as it is now “the international language”! Very un-French. He left, and we haven’t heard anything since. The village held a Vide Grenier about a month ago – that’s effectively a car boot sale, without the cars….There were stalls all over the main street and in the car park/petanque area/market square. Lots of junk, as always, but we did get a couple of nice rugs very cheap. About a month ago I drove up to Picardy, about an hour North of Paris and picked up a new addition to our family – Faust, a one year old Irish Wolfhound. 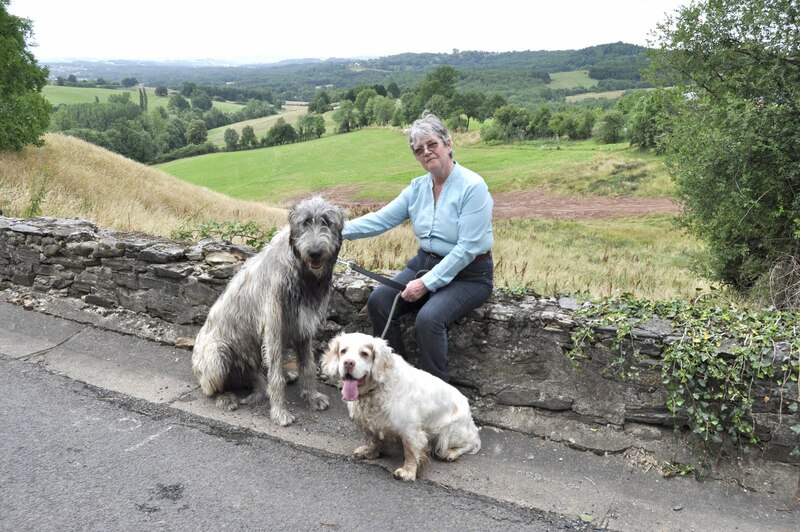 I found an ad on the French Irish Wolfhound Owners’ website – his owners had split up and couldn’t keep him. As we have had four wolfhounds before they were happy he was going to a good home. He has settled in brilliantly, and he and Bertie get on pretty well, although it might be stretching it a little to say Bertie actually welcomes his arrival. He is a great ice breaker with our French neighbours as well! Our first visitors of this period were Helen and Alan. They were caravanning in the Dordogne, and came to see us for the day. We then returned the visit, and went to their rather posh caravan park. As you can see, Fuast, whom we had for about a week, had setlled in pretty well! If he could learn to lie down in the car,though, journys might be a little easier. After them came Verena and Brian - two separate friends if you see what I mean. They seemed to have a good time, and we had a couple of good days out. It was made a bit more interesting when our car broke down on the day we were to pick Brian up from the airport. Luckily it was outside our house, and our wonderful local garage owner Jean-Louis came and picked it up on a trailer. I was able to hire a car in Objat, although I was quite surprised to find that the hirer would not take cards – only cheques! One good trip was to Les Eyzies, which is the centre for many of the prehistoric caves with the ancient paintings and sculptures. We went to one cave, which was firmly closed, with a very smalls sign to say tickets could be bought at another cave a couple of miles away. We drove there to find that at this time of year it is recommended that you book at least a few weeks ahead – of course none of the signs mentioned this. We visited the prehistoric museum in Eyzies, which was quite good, but probably had about as many flints on display as I want to view in the foreseeable future. Socially we have had a few nice days out – friends to lunch and dinner and back to theirs later. A garden party in the grounds of a very up market Chambres d’Hote for which I did some photography last year, and an invitation to an evening’s horse racing at Pompadour racecourse which was very enjoyable. Finally we have just had the Voutezac Peach Festival. Another evening meal with a peach-centric menu, and a firework display part of which was set off in our garden. By the way, if you couldn’t get your copy of June’s “French Property News”, that rather good article entitled “A Happy Twist of Fate” and about Voutezac, was by me. Copies can be sent on request.